Order your Parker Sonnet Matte Black Ballpoint Pen today from FahrneysPens.com. Fine Pens, Refills & Luxurious Gifts – great prices & fast shipping. But Parker doesn’t rest on its laurels – they’ve re-styled the Sonnet Lacquer Ballpoint Pen with appealing design upgrades: a new arrow clip and wider three-ring band. The Parker Sonnet Matte Black Ballpoint Pen comes in chrome or gold plated trim. 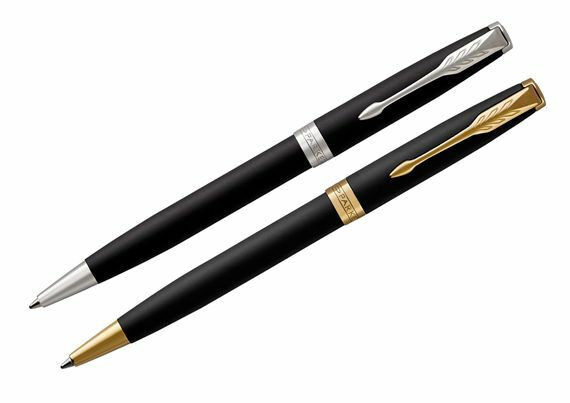 These impressive pens are made in France ensuring excellence in quality and performance. The Sonnet twist action ballpoint is a great choice for daily writing and gift giving. Parker’s best keeps getting better!